I recently bought a new camera. The camera came to me through a circuitous route. While the camera was something I needed and on a list of future purchases it was not planned to occur so soon. The story begins with my wife’s birthday present. My wife is an amateur photographer and loves all things associated with the art form. Her love of photography is trumped by one other which is her persistent fascination with the color pink. Whenever I look for my wife in a crowd I am always drawn to pink colored clothing. Often a comment if she is feeling well accompanies days were she in not clad in copious amounts of pink. Thus I was on a mission for her birthday present. She was already in possession of wonderful Canon SLR EOS 50D, but found that at times it was cumbersome. I was therefore to combine her two loves and purchase a smaller point and shoot camera in the color pink. Many hours of research ensued in the pursuit of a such a camera and I narrowed my choice to the Canon Powershot SX260 HS. This little camera sported many excellent serious features, yet still came in several less cynical colors, including pink. During my web browsing I indulged to to find my future camera, hopefully to be used for this very blog. I decided I liked the Canon SX280 HS with its excellent low light sensor and capability to shoot 1080P videos. Searching for the best deal possible, I found my wife’s 260 with a nice package of accessories and at a very modest price. Turning over my credit card information I purchased the it and promptly felt better no knowing I had a present for her and hopefully being the triumphant husband with the perfect gift. Sadly this was not to be, when I opened the brown box that was found on the doorstep a week later I discovered the company had sent me a beautiful red SX280. I instantly knew I could not fool the connoisseur of pinkness with this color. The next morning I informed my wife of the sad news and immediately offered to purchase another camera ,one which would for certain would be pink. I planned to return the foul red monster back to the misguided shipping company. However, my wife being the supportive person she is, suggested I should keep the 280 and use it as it was the one I wanted, minus the color. I offered that I did not mind the color as it would perhaps be a benefit should I drop or lose it in the woods. Unfortunately I could not know how correct I was at that very moment. I do have to admit I did feel a little like Homer Simpson and his bowling ball with Marge written on it, even if receiving the camera was completely unintentional. The Canon made a brief appearance during a goose outing and captured the images for the post entitled, “My Kingdom of Goosedom.” However the real test and first true outing into the field came this past Sunday. I had planned to call lions on Saturday, but weather and a bit of Christmas shopping kept me inside of the realm of civilization. By noon on Sunday I could stand it no more, I needed a mountain fix, windy weather or not I was going cat hunting. I took some precautions to protect the Canon. The camera had arrived with a Velcro case, which I had attached to the exterior of my backpack for easy access. I still felt this was not enough and added a high tech protective sleeve for the camera to reside in while in the case. This case was of course one of my socks; I made sure to select a clean one. Feeling that my new tech was now secure and snug in the case, I headed for the hills. I knew the wind would be an adversary for the day and decided to spend some time scouting several ridge tops in an area near the potential Lion call-in that occurred earlier this month. Shortly after the arduous climb to the rocky ridge, I discovered an excellent call stand. 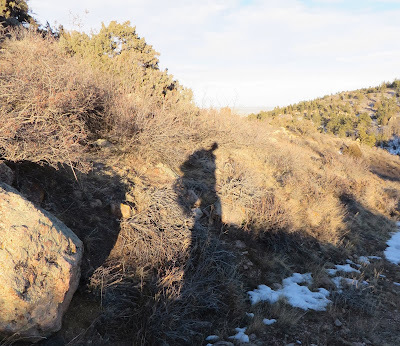 It was a rocky outcropping sounded by low scrub bushes, rocks, and several pines. The stand overlooked a long valley that held excellent Lion habitat. The backside of the outcropping was a sheer rock wall with a drop of approximately 30 feet. I knew this wall would make a great barrier to protect me from a Lion trying to slink in behind me. As the wind was not constant I decided to run a calling session and I set up the new Canon on a small tripod overlooking my right shoulder. I pressed record on the camera, did a short interview and settled in. Approximately 16 minutes into the call stand, a rather strong gust of wind blew along the ridge top. I heard a metallic clattering sound and I immediately had a sinking feeling. I knew what the sound was; it was the camera falling over onto the rocks. I then realized there was no obstacle preventing the camera from tumbling down the thirty foot drop. Risking movement to get a glance at where the camera was, I saw that it was gone, it had made the plunge. Broken camera or not there was no reason to end the call stand early simply to go triage the Canon. I waited with anticipation for the end of the stand, and after a hour I finally decided nothing was coming in. It was time to discover the fate of the camera. I found the bright red camera in a bush at the bottom of the wall. Thankfully the branches of the bush had softened the landing. The only damage to the Canon was a few very minor scratches. I was lucky and very happy that the little camera was still alive. As I still had some daylight left, I moved further into the hunting area to explore another ridge. Upon reaching the second ridge I encountered even stronger winds, several times I had to chase my hat when the wind dislodged it from my head. Calling in this wind was hopeless. I instead spent time scouting the area for Lion sign. Wandering through the rocks and junipers I found an elk kill site. 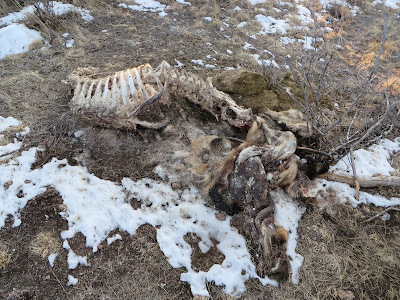 I immediately recognized the tell tale signs of the predator responsible, humans, natural predators do not leave neat little piles of leg bones and a skinned hide. Delving further along the rocks I found what appeared to be a Lion layup. It was a small alcove in a large rock formation that had signs of animal bedding in it. I reached into the pocket of the camera case to retrieve it for a picture and found the Canon was gone! I had used it to document the elk kill site and had difficulty stuffing the sock encased camera back into the case due to the extra material. The camera certainly had fallen out since that time. I immediately backtracked and found the Canon resting in the snow beside my trail. Once again the bright red color aided in the discovery; especially this time in the low light of sunset. As the day faded I headed back towards the road and the waiting truck. Along the way I crossed paths with a doe Mule Deer and a stately bull Elk. Due to the wind I was able to walk very close to the feeding bull before he noticed my presence. Once again I was impressed with how much game was in the area and the abundant food source for a large predator. Upon my return home I knew it was prudent to remove the excess material from the sock to allow it to stay in the camera case. I put the Canon into the sock and measured the correct amount to remove. With the camera in the sock I excised the unnecessary fabric. I immediately found that I had cut the camera strap in half. This poor camera had survived a fall, being lost, and now to add insult to injury the dismemberment of its strap. It was still alive, in excellent shape, and I have high hopes that it will endure its next outing, but I am not certain. For those still left wondering if a new camera was purchased for my wife? But of course the very same day I aquired mine.